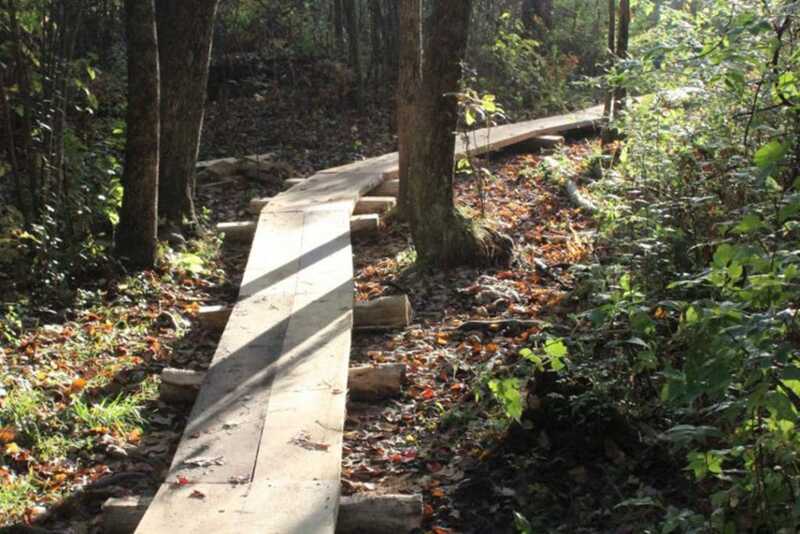 It all starts with a plan and permit when wetlands are concerned, but the latest stewardship project at Macricostas Preserve simply involved maintenance on a previously approved stretch of boardwalk through Meeker Swamp. Several sections had deteriorated after a decade of great use and needed replacing. 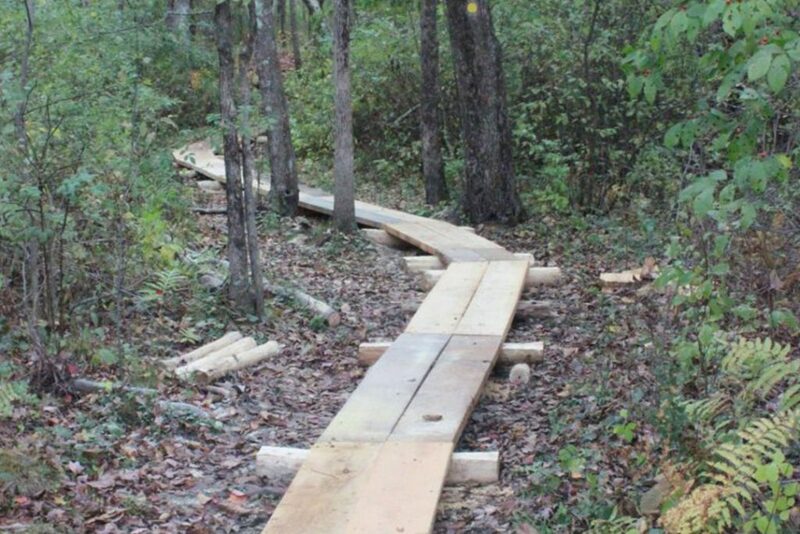 The beat boards were white oak, a good choice for lasting structures, but in this scenario, black locust, a non-native and invasive tree species of the area, is an even better option. 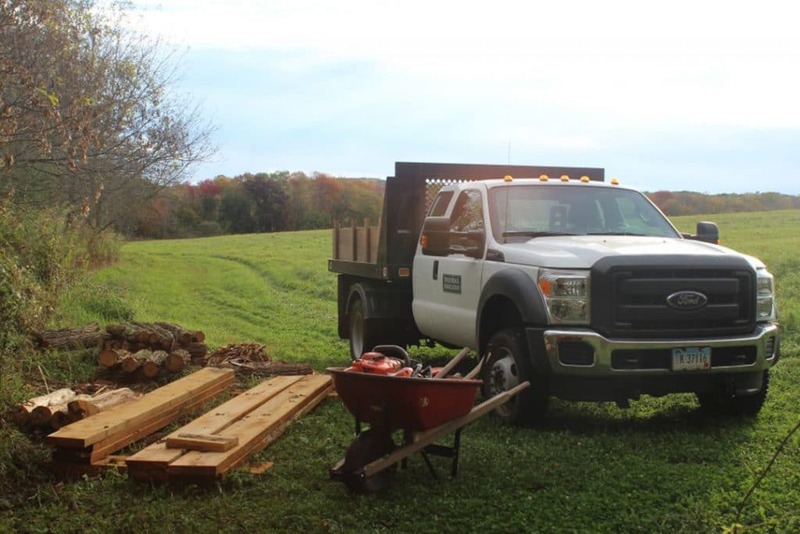 2 x 10″ locally-milled locust boards are purchased and stacked at the staging area, in addition to locust logs (6-14 inches in diameter) hand-harvested from a neighboring preserve. 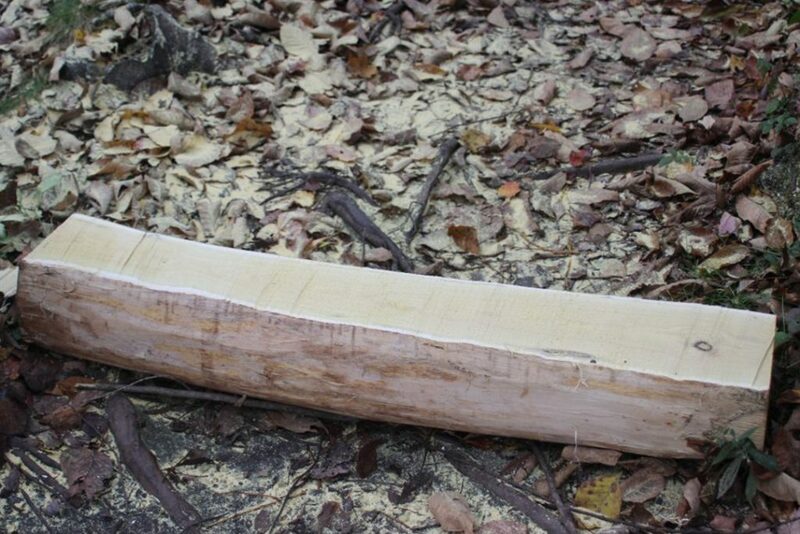 The bucked sections of log, referred to as “sleepers”, are what the boards will rest upon. Thick, deeply furrowed bark must be removed prior to use, a task largely accomplished with a drawshave. Peeling fresh logs is a tedious chore resulting in a mound of narrow scrap strips. 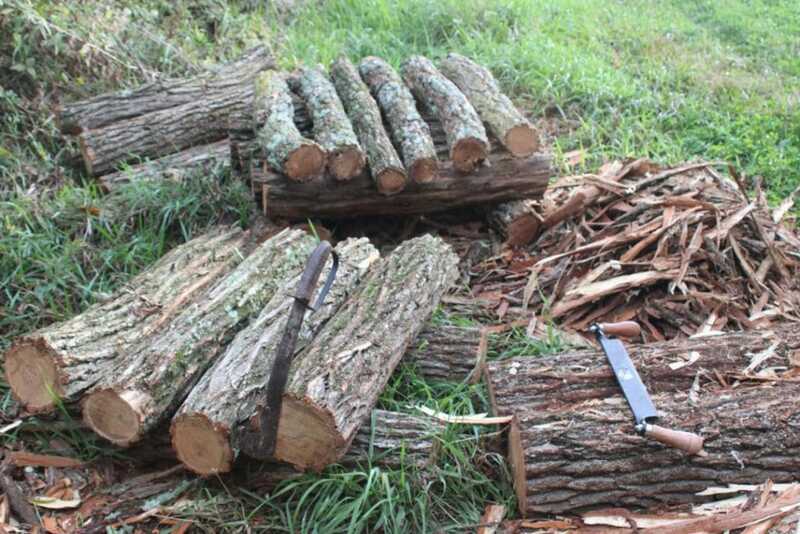 It is recommended to plan in advance and leave logs exposed to the elements for half a year, at which point the bark practically falls off in a nice, neat peel. 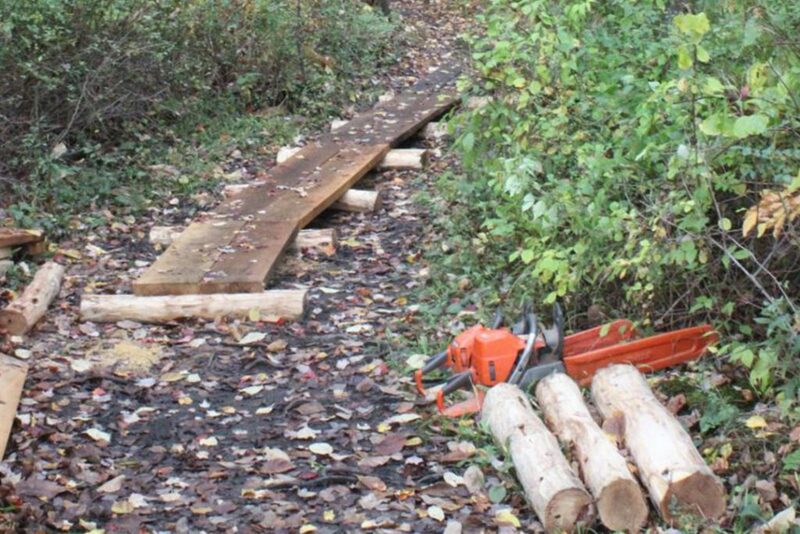 Boards, logs, and tools were hauled down the trail by foot. A wheelbarrow came in handy for smaller items like a drill, batteries, screws, hammer, pencils, angle, personal protective equipment (PPE), thermos of coffee, and water. Material was laid out appropriately as carried in, with pairs of similarly-sized boards deposited in length-dependent positions. Sleeper with a leveled face at a board intersection Note: Wet locust wood is very yellow as is its sawdust. Sleepers are placed where board sections intersect. Tops are leveled with a chainsaw fit with a ripping chain. Ripping chains have more teeth that create a finer cut than a normal chain. Removing long slabs while keeping a consistent angle can be hard to achieve without one. Shallow depressions are dug for stability and adjusted so the log sits even with the next. Stepping back and getting the side of your head at ground level gives you a line of sight for this judgement. Longer boards are given an additional sleeper in the middle of the section while shorter boards suffice with just end supports. Boards are then placed on the sleepers and assessed. Straightness of edges, bend, and direction of grain help determine which board will lie on which face and on which side. Once positioned, ends are marked for a cut that is consistent with the abutting section. Up-cutting along this line with a chainsaw is cleaner and won’t result in a frayed top edge like a down-cut would. Cut and placed snugly back in position, the boards are secured with heavy duty outdoor screws. 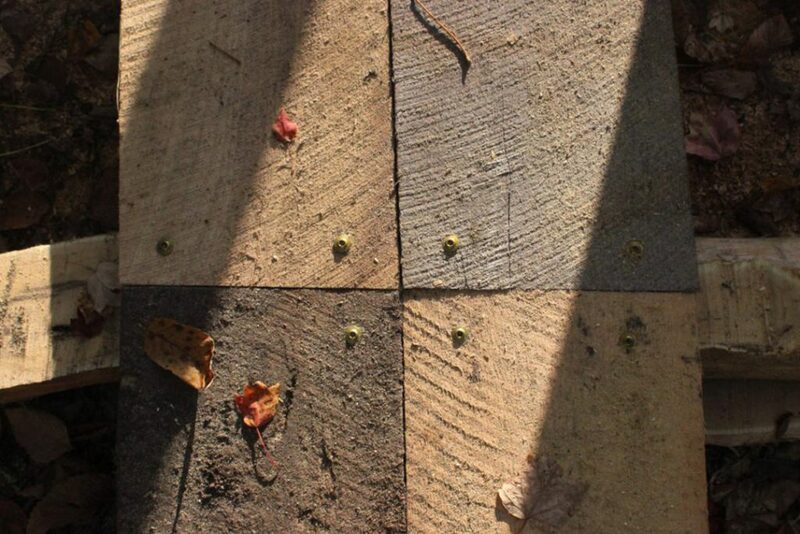 Forming a smooth curve in the boardwalk is achieved with varying lengths of sections. Short boards for bends and long boards for straighter projections. The final stages of walking its length, collecting scraps and reviewing the product, seeing its course, feeling its rigidity, and hearing its pleasing thud with each step, puts a conclusive cap on a rewarding project.